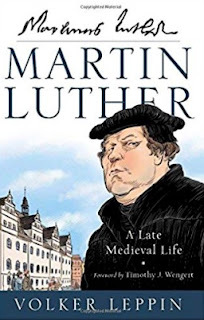 I just finished reading this short biography of Martin Luther by a church historian who focuses on late medieval history, Volker Leppin. One object of Martin Luther: A Late Medieval Life is apparently to demonstrate what should be obvious, that Luther, was to a great extent, a product of his time. Of course, this is true of all of us, even of those of who don't gain or win back insights that transcend our times, as Luther did. Leppin is at pains to demonstrate that Luther's theological thinking evolved, something which should also be obvious, although Leppin asserts this while casting doubt on Luther's later-in-life remembrances of how he came to his key insight: that God justifies sinners not by their merit, but solely through the grace that He extends to those who trust in Jesus Christ. I see no reason to pit evolution in the Reformer's thinking against the "tower experience" he gained in Wittenberg while preparing lectures on the Scriptures. Nor am I persuaded that Luther was an afterthought for the Reformation movement when he reached his later years. As a man under an imperial ban, it is true that Luther was unable to attend important gatherings, such as the Diet of Augsburg from which the Augsburg Confessions, a key expression of the evangelical (Lutheran) understanding of Christian faith, emerged. But it's also true that up until the end, Luther acted as a consultant to Reformation movements throughout northern Europe, functioned as a kind of Lutheran proto-bishop, continued his scholarly work, kept regularly preaching, mediated secular disputes (as he was doing when he died in Eisleben in 1546), and, most enduringly influential of all, produced, in collaboration with others, a complete translation of the Bible into a living, vernacular German, accompanied by his introductions to each book of the Bible and his margin notes on passages of Scripture. These are hardly the activities of a marginalized figure. Despite these quibbles, this is a fine biography, one which gives you a sense of the man in the context of his times. Leppin's quick summaries of the theological writings of Luther and his contemporaries will be useful, I think, to laity, clergy, and scholars. In the last chapter, Leppin tackles the awful presence of antisemitism in Luther's later writings. Luther's opposition to the Jews was theological, not racial. Yet, he said awful, ungodly things that were later used by Nazi apologists in Germany. Lutherans repudiate these writings and these prejudices play no part in the movement's confessional writings, even those written by Luther.